Reman Broder is an Imperial archer and vineyard worker who resides in the southwest portion of Skingrad. He is an advanced trainer in Marksman and is a member of the Thieves Guild. He wakes up in his house every day at 6am, and spends the first hour there before leaving for work. 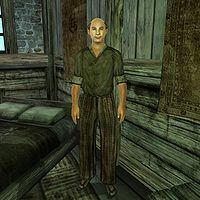 His employers are the Surilie Brothers, whose vineyard is located west of Skingrad. Here, Reman will work the land using his hoe until 8pm, only interrupted by a two hour lunch break at 1pm. After a long day's work, he will take his dinner out in the open as well, preferably on the bench near Grateful Pass Stables, while chatting with Tilmo. At 10pm, he heads back home and spends the last couple of hours in his house before finally going to bed at midnight. Similar to all his colleagues in the wine industry, he will stay home during rainy days. He will not offer any training while working in the vineyard or when he's eating, so the only times he will provide it is when he wanders around his house - which makes rainy days the best bet for training, as long as he's not eating. He wears a set of common lower-class clothing (coarse linens, a collared shirt, and oiled linen shoes) and is armed with a steel bow and arrows as well as a steel war axe. He also carries his key, a rake, a hoe, and a small amount of gold. His skills with a bow have not gone unnoticed among the townsfolk of Skingrad and they will recommend you to seek him out: "You know, if you need to get better at archery, you should talk to Reman Broder. He's quite a good shot." and "I've heard that Reman is good with a bow. Apparently, he's the best in all of Skingrad." They will also speak ironically of his employment at the vineyard: "Reman Broder is great with a bow. I think he could shoot the grapes off the vines, which is handy, since he works at the vineyard." His fellow vineyard worker Shameer will tell you a bit more: "Reman Broder... he works Surilie's vineyard, I work Tamika's vineyard... Reman spent 20 years in the legion, and he's an advanced Marksman trainer." The first time you approach him, he will introduce himself and offer his services: "Reman Broder, retired Archer, presently a grape-grower for the Surilies, at your service. Are you looking for advanced training?" When asked about why he chose to settle down in this particular town he will tell you: "I served as a Legion Marksman for twenty years. I retired here to Skingrad, work in the vineyards, and supplement my income as an advanced trainer." As an advanced trainer, Reman can provide you with the necessary reference for the Marksman master training quest. Once your marksman skill level reaches 70, speak to him, and choose the "training" option. If he responds with, "You know as much as I do about the art of being a Marksman. There is only one person I know of that is more skilled. I'm not sure I trust you enough to reveal any more to you." then he must be persuaded or bribed to raise his disposition to 80 or more. After that, he will be more talkative and trigger the quest pointing you towards master trainer Alawen with the words: "I can teach you no more. But I myself learned a few tricks from a Wood Elf Hunter; I'm sure she could teach you a few things as well. Last time I saw Alawen, she was out in the forest east of Anvil, and south of Kvatch. If you look carefully, you might find her there." Marksman Training: A master marksman wants your equipment to be up to scratch before she will train you. Reman's bed does not have an owner meaning you can use it to sleep, as long as you enter his house while he is present so that you are not trespassing. Esta página foi modificada pela última vez à(s) 22h47min de 28 de junho de 2013.